Wind Power Slider SS Mistral 8mm 1x1.6"
This Stainless Steel Slider Nut fits in Mistral Mast Tracks. 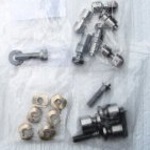 It screws on a One-Bolt or Two-Bolt Base (two nuts required) with 8mm threads. This is designed for a Mast Track that had or could have a car in it. It would replace the car, but adjustment would be by manually loosening the base moving it to the desired position and re-tightening the base.